THE BLOG ARCOORLO GUANTANAMERO ,CUBA: TO THE CUBAN PEOPLE: VOTE NO TO THE NEW CONSTITUTION. TO THE CUBAN PEOPLE: VOTE NO TO THE NEW CONSTITUTION. This is the moment we were waiting for some time ago. DO NOT ASITIATE TO REAFFIRM THE NEW LETTER MAGA OR SAY A ROTUND NO. We have long waited to exercise that peaceful and solemn right to change the course of a socialist country-and history has shown that communism and the new socialism only bring deprivation, hunger, repression and disrespect for the basic human rights of man. No more outrage to the freedom of expression, to free enterprise for the Cuban people themselves. Think of our heroes Mambises who fought years to get rid of the Metropolis. 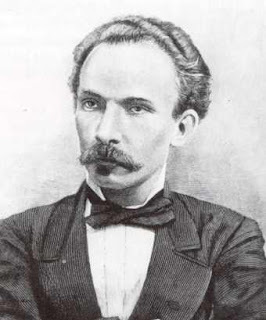 Even in José Martí who if he would live now would oppose so many years of dictatorship of a single party. The real palms will remain in the same place as always but will grow more vigorous until their tufts see the sea, as a peasant from the mountains of Oriente would say. What Cuba will be an appendix of Miami? Castro himself is to blame for pushing Cubans to emigrate north or to go to sea at the mercy of sharks. Now they want to emigrate to any country for not suffering more hunger and learning about democracy. The Democracy can be improved but from the same people, with a free press, freedom of expression and plural partididimo. The unique system proposed by the new constitution is again more of the same: slavery and tyranny and above all Hunger. DO NOT. DO NOT VOTE FOR THE NEW CONSTITUTION FOR MANY PROPAGANDA THAT THE GOVERNMENT MAKES THAT WHAT THEY WANT IS TO GET TO THE POWER. FREEDOM COSTS HARD. MUCH HATE HAVE SOWNED IN THE PEOPLE AND THIS WILL BECOME AVANGED. THEY ARE AFRAID FOR A CUBAN FREE OF SOCIALISM. MARTÍ AS OUR APOSTLE AND NOT LIKE THE SÁNGANO DE MARX AND ENGELS THAT ONLY MISERY AND WAR BROUGHT TO THE WORLD.